So far I have not had the privilege of owning the first Breyer Indian Pony model released which is a matte alabaster with a red handprint on her left haunch and a blue square on her left neck. 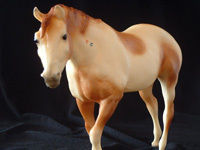 However, I have many others, which include the second release of this wonder Breyer model in matte Buckskin. She has a red sun on her left haunch and blue dots on the left side of her neck. Both of these models were produced from 1970-1972. The Buckskin Indian Pony has been widely sought after and desired by Breyer collectors of Original Finish models and Vintage Collectors. The next one is the model on the Indian Pony mold that was made from 1970-1976; she is a matte brown pinto with many variations. Some of these wonderful models were made with "war paint" on their sides and others were not. Even the war paint markings can vary with each model. Most typically there will be two upside down "U" shapes on the left side of the neck and two "Z"s on the left flank. However, some of the models have what looks like a tepee with a large round dot over it on their right side, but the location can be different. I have seen some with this tepee up on the right shoulder and mine has the tepee on the right flank area. All of these details makes collecting these beautiful models so much fun, add to that all the variations in the paint and the position of the brown spots. You can have an entire "conga line" of Brown Pinto Indian Ponies with none that are the same. I like to greet my day with my Indian pony conga line mug, or if I'm feeling a bit contrary butts and all. The next one is the matte dark bay Appaloosa Breyer Indian Pony which was made from 1973-1985. She is the first Indian Pony model that was done as an Appaloosa and I have seen some wide variations in her coloring as well. Is it any wonder why these models have been so very popular among Breyer Horse Collectors for so many years? There are collectors who call themselves "variation collectors". 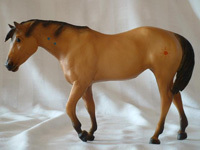 They will purchase several of the same favorite Breyer model horse just to compare the variations. I have seen many differences in the models that I have owned of the same mold, and each one has its own character and is unique.